Adults From $ Children From $ Taxes and fees not included. 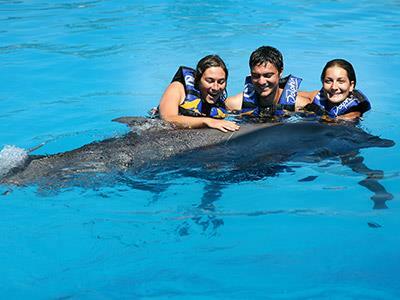 An exciting family adventure awaits you at Aquaventuras Park in Puerto Vallarta. The Dolphin Encounter Puerto Vallarta, Dolphin Discovery Tour is suitable for children aged one year or higher and offers the unique opportunity to see these magnificent creatures up close. Get into the water and enjoy getting to know the dolphins. Throughout the activity, you’ll stand on a platform as the dolphins approach you for a hug, a handshake and a kiss. After playing with the dolphins, you can explore the rest of the park and take a ride on the lazy river or one of the exciting water slides. This Puerto Vallarta water park is open from Tuesday to Sunday and the dolphinarium is open daily.